One of America's leading documentarians has done it again. Ken Burns, producer of the widely watched and hailed documentaries, Baseball and The Civil War, has now teamed up with Lynn Novick to examine the rise, fall, and repeal of the 18th Amendment banning alcohol sales and production. It is a worthy effort, and well-executed. The multi-hour must-see premiered over three nights this week on PBS, pulling in nearly four million viewers on its opening night -- very big numbers for public TV. It's also available online at the PBS Ken Burns Prohibition web site. For most us of Prohibition is ancient history, skimmed over bloodlessly in dusty tomes in high school and undergraduate history courses. My 83-year-old mother, for instance, was still a toddler when revelers across the land tippled with delirious joy to mark repeal. For anyone younger than her -- and that's most of us -- Prohibition is no more than a school lesson, not a thing of living memory, except, perhaps, for an old story or two told by grandpa or grandma. One of the successes of Prohibition is the way it brings that dry history to life. Through the skillful use of contemporary film, photographic stills, oral history, written remembrances narrated by actors, and a lively narration by Peter Coyote, Burns and Novick are able to recreate the living, breathing reality of second half 19th and early 20th Century America. Staring face to face at the glowering glare of a doughty battle-axe like Carrie Nation or the lizard-lidded, full-lipped gaze of Chicago gangster Al Capone, listening to Al Smith rail against the dries or Mabel Willibrand rally preachers against repeal, helps us put a human face on the passions and frailties behind the march of the social revolution that was Prohibition and the mass rejection of it that was repeal. Similarly, vivid scenes of saloon debauchery, with passed out drunks and giddy tipplers, of speakeasies filled with good-time guys and giddy flappers, of mass marches for and against, of political conventions and campaigns in which Prohibition was a burning issue of the day, help put living flesh on the dry bones of history. The early 20th Century experiment in social control and legislating morality contains many lessons for contemporary activists seeking to undo the damage done by drug prohibition. Burns and Novick deserve our thanks for teasing out the varied strands that turned the 19th Century's temperance movement among mostly rural, Protestant, church-going women into a political powerhouse capable of blunting the power of big booze, shuttering the breweries and distilleries, and eliminating the saloons men saw as their last refuge from the demands of wife and children. 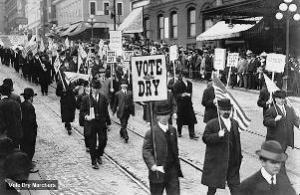 For me, the most important achievement of Prohibition is the way in situates the temperance movement within the broader social and political context of a tension-filled, rapidly evolving America. As Burns and Novick make abundantly clear, Prohibition did not happen in a vacuum. Among the forces propelling it were many of the same forces active today propelling reactionary social movements: racism (directed against newly arrived Irish, German, and Jewish immigrants), nativism (ditto), religious bigotry (aimed at those Catholic immigrants), nationalism (against mainly German-American beer brewers, especially during World War I), and rural vs. urban tensions. But while it may be easy to ridicule the reactionaries of the last century, the roots of Prohibition also come uncomfortably close for present-day progressives. The temperance movement -- in all its intemperance -- was closely tied to "what about the children!" sentiment and women's suffrage, a cry for healthy living, as well as the sort of "do-gooderism" conducted by "busybodies" that still informs much of the discourse when it comes to drug policy reform today. As Prohibition shows most excellently, the politics of morality and social control are deep and twisted, and unraveling them reveals some unflattering facets of progressivism, as well as the more easily derided absolutists of what could fairly be called the Christian Right. Where Prohibition is perhaps most useful to modern day drug reformers is in its depiction of the social ills it generated. Much as the Drug Policy Alliance likes to say "drug abuse is bad, drug prohibition is worse," viewers of Prohibition could fairly draw the conclusion that "mass drunkenness is bad, mass drunkenness under Prohibition is worse." Burns and Novick sketch the rapid expansion of organized crime under Prohibition, the gang wars of Chicago and New York, the corruption of cops and public officials -- all the side-effects of prohibition so familiar to present day reformers. But they also look at its public health consequences, which -- like current drug prohibition -- were also in many ways disastrous. There were mass deaths from bad bathtub gin, deaths from drinking wood alcohol, outbreaks of "Jake Leg," a neurological disorder caused by contaminated whiskey that crippled hundreds, if not thousands, and while alcohol consumption initially declined, that decline was soon reversed, and with even more unhealthy drinking patterns. In the end, Prohibition died of neglect, ridicule, and changing social attitudes, forged at least in part by the experience of Prohibition itself. And at the end, it revealed itself to be hollow, crumpling with amazing rapidity after the Great Depression hit and the big city, immigrant-friendly Democrats under FDR took power. 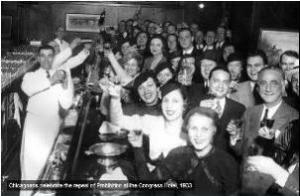 Before the end of FDR's first year in office, Prohibition was history. There are many lessons and parallels for contemporary drug reformers in Prohibition, but they are not exact and may not apply across the board. Alcohol prohibition lasted barely a decade, but drug prohibition is now in its second century. Why one was a flash in the pan and the other remains a painful, enduring legacy are questions that need to be answered if we are ever to leave drug prohibition in the dustbin of history along with Prohibition. Prohibition can help us start to ask the questions that will give us the right answers. Disappointingly, Ken Burns doesn't appear interested in pursuing the parallels, nor even the dissimilarities, between Prohibition then and prohibition now. He does not reference the prohibition of other drugs in Prohibition (although heroin and cocaine were already criminalized federally and marijuana was being banned in a number of states), nor, as he has made clear in interviews, does he see a useful comparison between the two. But that disagreement or lack of boldness notwithstanding, Prohibition is still a great viewing experience that brings alive a critical episode in US social and political history, an episode who reverberations still linger and whose contours are still echoed in drug prohibition. This is your history, America -- watch, enjoy, learn, and ponder. President-elect Barack Obama met Monday with Mexican President Felipe Calderón to discuss bilateral issues of major importance for the two countries. In addition to NAFTA and immigration policy, Mexico's ongoing plague of prohibition-related violence was high on the agenda. 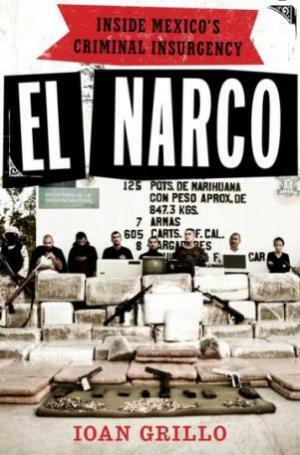 More than 5,400 people were killed in the violence last year, and more than 8,000 in the two years since Calderón ratcheted up Mexico's drug war by sending thousands of troops into the fray. The multi-sided conflict pits rival trafficking groups -- the so-called cartels -- against each and the Mexican state, but has also seen pitched battles between rival law enforcement units where one group or the other is in the pay of the traffickers. The Obama-Calderón meeting comes as the violence in Mexico is creating increasing concern among US policy and defense analysts. 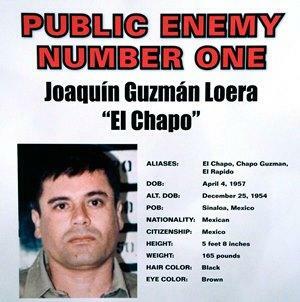 Last month, the National Drug Intelligence Center warned in its National Drug Threat Assessment 2009 that "Mexico drug trafficking organizations represent the greatest organized crime threat to the United States." In a December report to the US Military Academy at West Point, former drug czar retired Gen. Barry McCaffrey warned dramatically that even the $1.4 billion, three-year anti-drug assistance plan approved by Congress and the Bush administration last year was barely a drop in the bucket, noting that it was only a tiny fraction of the money spent on the US wars in Iraq and Afghanistan. "The stakes in Mexico are enormous," McCaffrey warned. 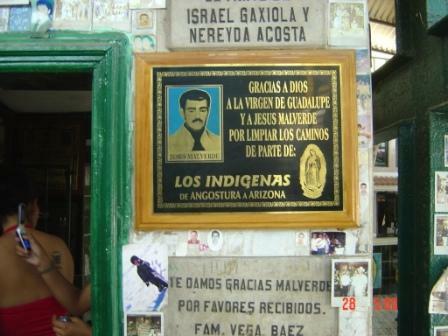 "We cannot afford to have a narco state as a neighbor. 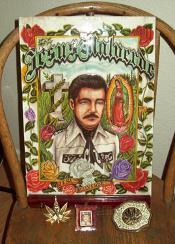 Mexico is not confronting dangerous criminality -- it is fighting for its survival against narco-terrorism." The consequences of US failure to act decisively in support of Calderón's drug war would be dire, McCaffrey warned. "A failure by the Mexican political system to curtail lawlessness and violence could result in a surge of millions of refugees crossing the US border to escape the domestic misery of violence... and the mindless cruelty and injustice of a criminal state." This week, the US Joint Chiefs of Staff jumped on the bandwagon. In their report, The Joint Operating Environment 2008, which examines global threats to the US, the Joint Chiefs warned that Mexico was one of the two countries most in danger of becoming a failed state. The other was Pakistan. 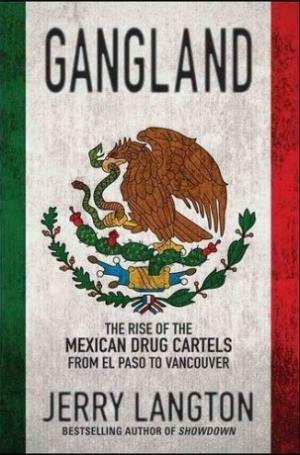 "The Mexican possibility may seem less likely," the report noted, "but the government, its politicians, police, and judicial infrastructure are all under sustained assault and pressure by criminal gangs and drug cartels. How that internal conflict turns out over the next several years will have a major impact on the stability of the Mexican state. Any descent by Mexico into chaos would demand an American response based on the serious implications for homeland security alone." But for all the dire warnings of doom, the incoming president gave little sign that he would do anything other than stay the course. Nor did he suggest in any way that he would make a radical break with US drug policy on the border. Obama has stated publicly that he supports the Mérida Initiative aid package, and Monday he limited his public remarks to generalities. Noting the "extraordinary relationship" between the US and Mexico, Obama added: "Not only did we talk about security along the border regions, how the United States can be helpful in Mexico's efforts, we talked about immigration and how we can have a comprehensive and thoughtful strategy that ultimately strengthens both countries." Despite taking his first meeting with a head of foreign state with President Calderón and pledging renewed cooperation, and despite the chorus of cassandras crying for more action, analysts consulted by the Chronicle said that given the raft of serious problems, foreign and domestic, facing the Obama administration, Mexico and its drug war are likely to remain second-tier issues. Nor is the Mérida Initiative going to be much help, they suggested. "Obama is busy with other pressing issues," said Sanho Tree, drug policy analyst for the Institute for Policy Studies, a Washington, DC-based think tank. "He just doesn't have the space and will to take on this other fight in Mexico." On the other hand, the border violence frightening US policy makers is largely "a self-inflicted wound," Tree said. "Mix together high domestic demand here, prohibition economics, and a tough law and order approach, shake vigorously, and you have a disaster cocktail. It's not like we didn't warn them," he said. Also, Tree noted, despite the rising alarm in Washington, there is little interest in opening a new front on the southern border. "Who has the stomach to take this on right now?" he asked. "Who is clamoring for this outside of institutional actors who want to protect their budgets? There is a lot of war-weariness and budget shock in this city, and that might leave some openings" for reform, he said. "Probably not much will come of that meeting," said Tomás Ayuso, Mexico analyst for the Council on Hemispheric Affairs. 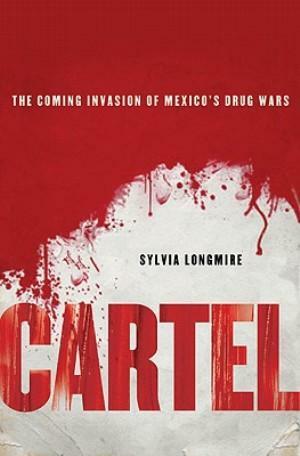 "Calderón was pleading for Obama to put Mexico at the top of his list of priorities, but given what Obama is facing, the Mexican drug war is not at the top of his agenda." Still, the situation in Mexico is serious and could get worse, Ayuso said. 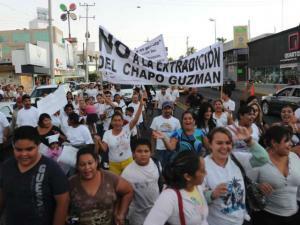 "If this isn't addressed now, Mexico could really descend into chaos. 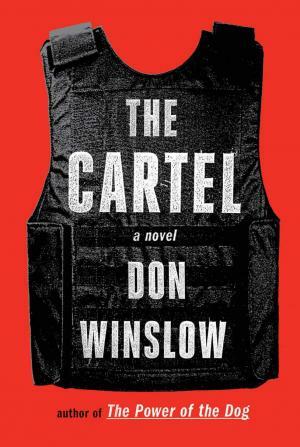 The drug cartels have virtually unlimited funding, their coffers are overflowing. The shadow economy in which they operate is booming, their operatives are armed to the teeth, and the next step is to set up a shadow government. It's very easy for them to influence people. They say: 'Accept our bribes or we'll kill you and your family.'" Ayuso said. "It's pretty effective." "This meeting looked mostly like generalities, but Obama has said repeatedly during the campaign that he supports the Mérida Initiative, and that will most likely continue during his administration," said Maureen Meyer, Mexico analyst for the Washington Office on Latin America. "With more and more reports lately painting Mexico as a security crisis, we are seeing a recognition by the new administration that this is a priority, and it will continue cooperating with Mexico." 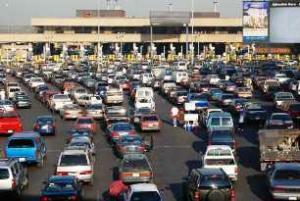 But the looming crisis on the border and in Mexico could provide openings for reform, Meyer said. "We hope to have more openings to reopen the debate on US drug policy internationally, and Mexico could give us the opportunity to look at what has and has not worked in the Andean region and Mexico as well," she said. That debate could include modifications to the Mérida Initiative, which is heavily weighted toward military and law enforcement equipment and training, said Meyer. "Congress has reiterated its support for the Mérida Initiative, but we've also seen a tendency to redirect funding toward arms trafficking going south and demand here in the US. The Congress will also, we hope, start to look away from sending more equipment and toward more support for institutional reforms. Helicopters aren't going to have any impact on Mexico's underlying problems," she said. The violence in Mexico could help further weaken already eroding support for US drug policy in the hemisphere as a whole, said Ayuso. "In Latin America, where most of the suffering is happening, many countries are asking whether the Washington-led war on drugs is the answer," he said. "That's something Calderón himself has brought up, but Obama is probably not going to budge on that. Still, the chorus is growing. 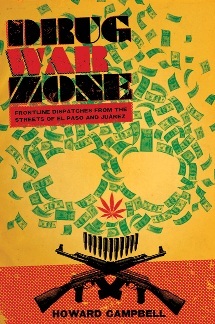 More and more people want to reevaluate the drug war."